Super Savings Item! Save 31% on the Edifices de Rome Moderne (Reprint Series) by Brand: Princeton Architectural Press at Translate This Website. MPN: 9780910413008. Hurry! Limited time offer. Offer valid only while supplies last. 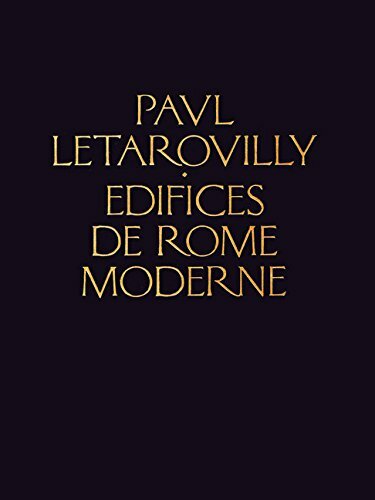 Paul Letarouilly's masterpiece, Edifices de Rome Moderne, has been hailed as the most beautiful book on Renaissance architecture ever published. Paul Letarouilly's masterpiece, Edifices de Rome Moderne, has been hailed as the most beautiful book on Renaissance architecture ever published. Letarouilly devoted 35 years to drawing the plans, sections, elevations, perspectives, and large-scale details of gardens, convents, palaces, and churches of Renaissance Rome. His keen observational ability and immaculate drawing skills make this work an indispensable sourcebook. In many cases his etchings remain the only measured plans or elevations available; he also recorded buildings destroyed by later demolitions. Princeton Architectural Press's Reprint Series was established in 1981 to make rare volumes on architecture available to a wider audience. The books' beautiful reproductions and finest quality printing and binding match those of the originals, while their 9-by-12-inch format makes them accessible and affordable. New introductions bring a modern voice to these classic texts, updating them to become invaluable contemporary resources. These critically acclaimed books are an essential addition to any library. If you have any questions about this product by Brand: Princeton Architectural Press, contact us by completing and submitting the form below. If you are looking for a specif part number, please include it with your message.